The word Reiki means Universal Energy. By channeling this divine and most powerful energy of God we can cure all diseases like diabetes, cancer, heart ailments, blood-related issues, etc. Reiki healing is a very powerful form of healing where we channel the universal energy/divine energy of God to heal a person, place, or situation. It can also heal mental issues, blockages in career, business, finance, education, etc. 1. What is Reiki and how it works? History and lineage. 3. Professionalism, and how to treat clients and respect Reiki. 7. Detailed information of Chakras and body parts they’re connected with, planets associated with each Chakra and life situation affected by each chakra. 8. 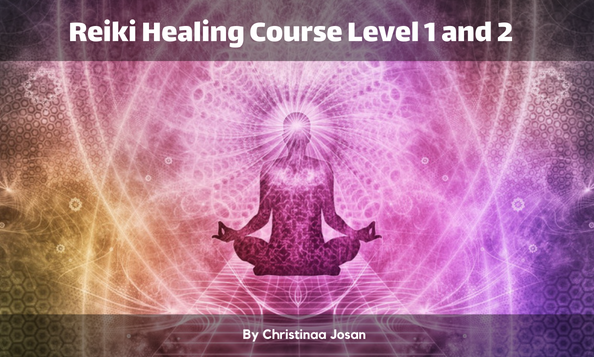 About the 3 Reiki Level 2 Symbols – Power Symbol, Balancing Symbol, and Connecting Symbol. 9. Treating clinical illnesses and injuries, mental issues, emotional issues. 10. Giving Reiki Treatments – How to give effective Reiki Treatments. 11. Healing relationships, blockages in marriage, business, finance, career, job, etc. 12. Purifying, balancing and enhancing the energy of a person, home, workplace, etc. 13. Healing animals and plants. 14. Practice hands-on healing session. 15. How to do distance healing. 16. Working holistically to maximize the healing effect of the treatment – How to treat the presenting illness/injury and any underlying causes using Reiki and intention/visualization. 17. Empowering the client to take responsibility for their recovery and develop a treatment protocol that includes the clients taking action to help themselves. 18. Chakra Scanning to identify blockages. 20. Wish fulfillment through Reiki using Wish Grid. 22. Guidance on working as a Reiki practitioner and setting up practice. Reiki is a great way to enhance your connection with God which enables wisdom to flow in triggering spiritual growth. With regular practice, one can transform their lives completely. About the Facilitator: Christinaa Josan is a born clairvoyant. She discovered her intuitive abilities at a very early age, and has had many profound spiritual experiences since early childhood. After several years of working in the corporate, she finally chose her path and started her spiritually based business about eight years ago. Throughout the years Christinaa has been helping many people with her ability to provide accurate readings and do powerful healing work. She loves to work with God, Angels and various Deities and saints. Apart from healing work Christinaa spends her time with her pets and working for animal welfare.